I enjoyed the first Pirates of the Carribbean movie. Loved it in fact. I thought Johnnie Depp’s performance was hilarious and well worth all the attention it received. The action was intense and spiced with humor. A great flick. Then I watched this movie, the sequel, and wondered where it all went wrong. Dead Man’s Chest broke box office records for having the largest opening weekend ever. Something like a bazillion dollars. People flooded to the multiplexes to see this movie. Were they as disappointed, I wonder, as I was? 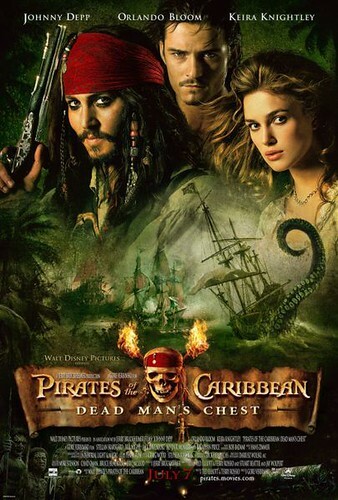 Dead Man’s Chest felt more like a theme park ride than a movie, which is appropriate, I suppose, since the franchise is based on the Pirates of the Caribbean ride at Disneyworld. The problem with this comparison, of course, is that theme park rides are fleeting bursts of suspense quickly forgotten once the ride stops. You can’t find meaning in a theme park ride, nor is there any rational order of events. It’s just random action: swoop this way, jolt that way, zip upside down, and as quickly as it’s started, it’s over. Please exit to your right. That’s Dead Man’s Chest in a nutshell, a series of seemingly random events that don’t appear to coincide with anything that has happened previously. One minute the pirates on a ship sailing the seas, the next they’re on an island inhabited by cannibals with Captain Jack mistaken for a god. Imagine that, someone mistook for a god. How original. What a unique plot invention. I never would have thought of it (rolling of eyes). Tsk tsk. The whole mistook god thing was an old joke back when the Ewoks did it in Return of the Jedi. Doing here feels stale. But even more annoying was how characters from the first pirate film kept popping up randomly throughout the sequel completely untrue to themselves; as if the screenwriters were bored with their own creations and felt the need to reinvent everyone. The commodore, for instance, the picture of a perfect English gentleman is now a drunk, foul smelling blaggart with a self-serving violent streak. And the fair maiden (Keira Knightley), who was unquestionably valiant to her love in the first film, is now unjustifiably attracted to someone else. Ugh. No, I was terribly disappointed with this film. Lauren and I even debated turning it off before it had finished, but I said no, let’s give it time. It’ll get better; I’m sure of it. But it didn’t get better. And rather than leave me in anticipation for the third film, Dead Man’s Chest left me indifferent. Will Captain Jack be rescued from the sea monster? Will Keira Knightley redeem herself and run back to her faithful Will (Orlando Bloom)? Will Will’s father be rescued from eternal servitude to Davey Jones? Do I really care one way or another?